Everyone know that the search for good employees has only gotten tougher. As it’s begun to take longer to find and hire people, there has been a renewed emphasis on retention. Employers have begun coming up with new strategies, such as working from home and flexible work schedules. Companies are also coming up with new benefit offerings. For instance, Facebook offers free housing for interns and Netflix has implemented unlimited vacations. Smaller companies are also offering new and novel benefits, like pet insurance, paid volunteer time, and on-site massages. New, novel benefits are all fine and well, and they can go a long way toward attracting and keeping talent. But they don’t address one of the prime reasons employees leave- a lack of appreciation. OC Tanner recently published a 10 year study showing that a lack of employee appreciation is a factor in changing jobs for nearly 80% of employees. There’s a lot of ways to show appreciation, but the most direct is the employee performance evaluation. It’s also one of the least utilized. Think about it. Have you ever heard anyone say they received a useful employee review? The idea seems ridiculous, doesn’t it? And yet, the performance review is something that happens, or is supposed to happen, for every employee at least once a year. The cynicism that often greets performance evaluations comes from employers not appreciating the value of the opportunity. Employers don’t often make good use of performance evaluations. It’s often treated as a dry inventory of the events of the previous year. Nevertheless, the performance review can be among the most valuable interactions you can have with your employees. When a performance evaluation is properly implemented, it’s a roadmap. It tells you where you’ve been, it shows you where you can go, and it gives you directions on how to get there. Any HR professional will tell you that a performance evaluation should start with feedback about what an employee has done within the evaluation period. You should use the goals from the last evaluation, or, if this is the first evaluation, you can use the employee job description. The performance review should be used for a frank discussion on accomplishments and goals that are still in process. This will provide perspective on what has worked for the employee and what hasn’t. During the evaluation, you can discuss the goals that haven’t been met yet and determine new approaches and new goals. Employees want to know where they stand, so be honest and open. The criticism you give should be constructive, because ultimately, this is the only way your employee will improve. It’s easy to think of a performance evaluation as a one-way interaction in which you give an employee praise for success and discuss their opportunities to excel. But it doesn’t have to be so one-dimensional. The most productive performance evaluations should be a conversation, not a lecture. Take a moment to really listen to your employee. Ask what they consider their best accomplishments during the evaluation period and find out what they need to repeat and build on their successes. Ask for their ideas and find out how you can support your employee, especially when it comes to training needs. After all, their success not only helps the company, but also reflects on you as their leader. Employees will talk to each other, but they might not talk to managers, supervisors or even their Human Resources department. In fact, employees naturally regard management with distrust. This means that you may miss out on important information that can improve your business. It also means that your employees may not be as motivated to go the extra mile. Even worse, it can increase the likelihood that they will leave. There are a lot of things you can do to prevent turnover, but one of the simplest, and most effective is maintaining an open line of communication. Obviously, the performance evaluation isn’t the only time you should speak to your employees, but it is a critical opportunity. When it comes to work, people will usually assume that everything is going okay. It rarely occurs to us that we might be making errors. We have to be told that we’re not doing something correctly. Meanwhile, little mistakes continue, add up, and compound until your employees are making a lot of mistakes, possibly some quite big. When they find out about mistakes they’ve made, they are often confused and angry – and not without reason. What’s more, they often complain to their friends and co-workers about the situation, which detracts from morale. Most of us have a pretty poor understanding of our weaknesses. You can’t put your faith in your employees “just getting it” if you don’t tell them. If you don’t say it, they won’t get it, and the situation will not improve. More than that, you will give the impression that you or the company just don’t care. Once that trust is broken, it is very difficult to get back. A good, detailed performance evaluation takes time and effort. It’s an investment in your employee, and by doing it right, you show that you value the work they do. By putting the effort into giving a good review, you are paying respect to your employee. Don’t be afraid to ask HR for support and direction on developing and delivering an effective review. When employees are asked why they change jobs, a distressing number of them report feeling like they weren’t valued by their previous employers. Of all the HR issues that naturally come up in exit interviews, this is probably the most frustrating because it’s the easiest to solve. The remedy to this situation is an open dialogue between you and your employee. The performance evaluation is a perfect place to begin that conversation. When you pay attention to your employees and give correction and encouragement as needed rather than waiting for a conflict or a near disaster to arise, you show them that you are on their side. 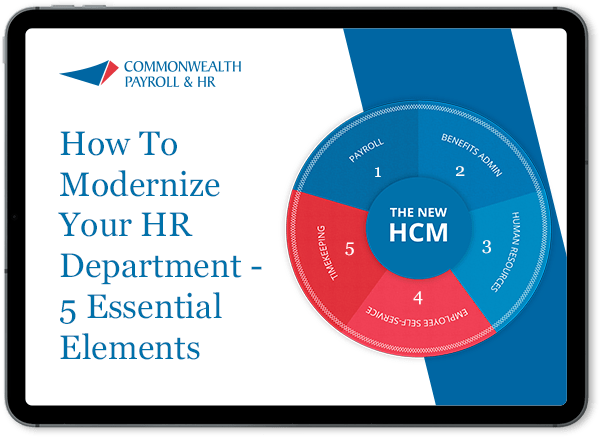 For more information on how Commonwealth Payroll & HR can work with you on your strategic human resources planning, call us today at 877-245-1159.